Actually alot of these milestones were achieved few months ago but I did not have the time to record it on the blog. The video below is to show her latest developments since we (Meng & I) don't really take alot of videos of her, this will serve to remind us of her milestones from 20-26 Months Old. 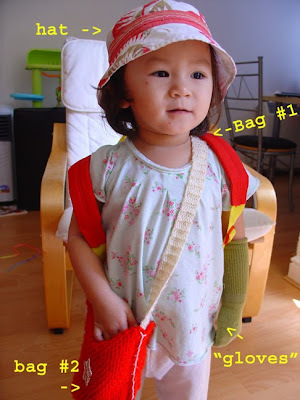 Height : 85cm (as of 25 Months Old) which is at the 25th percentile. 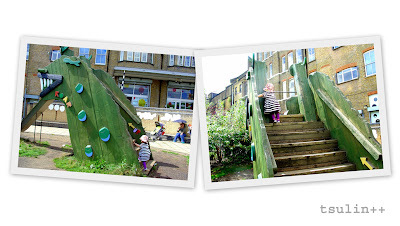 Shape recognition : She can recognise the basic shapes such as triangle, circle & rectangle. 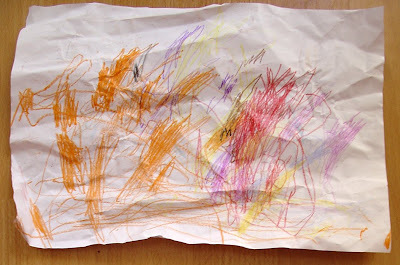 As for square, she will usually say it is a rectangle but we are currently working on this. Alphabets : She can visually link the alphabets with what the alphabet is for, for example if you show her letter "H", she can tell you it is for HOUSE. Sometimes she will point to a letter on the keyboard & tell me what it is for, how very cute! So far, I have managed to teach her "The letter A is for Apple...." from A to F. Also, she only knows the letters in capital. She hasn't recognised, or should I say, has not been exposed to the small-caps yet. Shean Wenn & I made our way to the appointed DLR station to meet with the organiser & other moms as this is a day-out organised by the Local Surestart Centre (government-funded centre for kids's welfare & activities, every borough has a few centres for the convenience of parents). We had to take the DLR (again) to get to the last station which is Stratford, walk for 15mins before reaching the destination - DISCOVER, "the story making centre". Just the day before as i was casually informing Meng that I'd be bringing SW out to Stratford for a "Discovery Trip", he asked me what was it about? I scratched my head & didn't know how to answer him because frankly, they didn't say much on the itinery. I replied him, "It'll be fun!! Furthermore, Jessica (my friend & her daughter & another kid) will be there". And what a perfect day it has been! 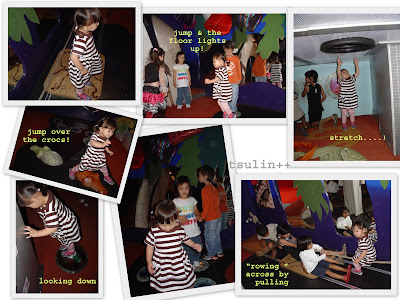 The day exceeded all my expectation, in terms of "fun" factor & also, SW's behaviour - she was SO well behaved the whole day being her chirpy self. I was so impressed. I definitely had alot of fun bringing her out although I was knackered by the time we came home (and had to cook, not forgetting!). 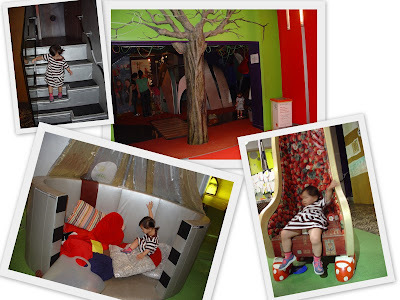 Discover Centre is like a mini-playground attraction for kids, indoors & outdoors, there are alot of funt hings to be dicovered by kids - ageing from 1YO to probably 7YO. 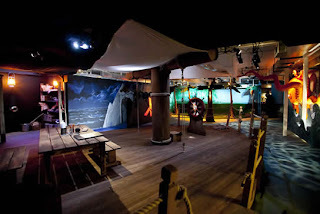 Downstairs in "Pirate" Land/Ship. 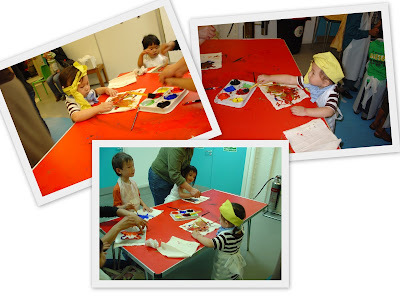 Shean Wenn is Pirate "Yellow Bandanadee" for the day :) Look at the yellow bandana & blue scarf that mummy put on her, thereby transforming her into the Pirate of the Day. Later on, they proceeded to next door where they could paint their own flags. They provided an apron for her and lots of colours & brushes. While the paint were left to dry & fixed to a rattan, we had snack time and also face-painting. Sadly I didnt allow SW to do face-painitng because frankly, I just didn't wanna wash off the paint from her face. And also I remember MIL telling me last year not to let her do face-painting because of her eczema.. Maybe when she is older she can do that. It was almost 3.30pm when we were done. We then went upstairs again where the kids played. This is a "ship" area and look how enthusiastic SW is at having a go at the, umm.. what do you call the ship steering thing? Well,.. yeah, you know what I mean. (Inside the room upstairs where more toys await them). Just before going home, Jessica & I brought the kids outside to play at their playground. It isn't a very big playground but it's got loads of fun equipments for them to tire them out. 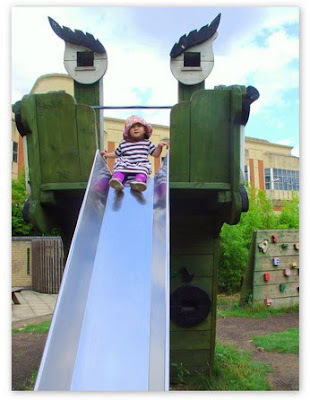 There was this slide which is REALLY high (photo below) and without any hesitation, SW climbed it without me knowing! How I realised was when she called me from the top ("Ha-know mummy!!" - Hello mummy) before proceeding to slide down! Oh my, what a brave little girl. The slide looks like a green monster. Shean Wenn on top of the "green monster" slide! 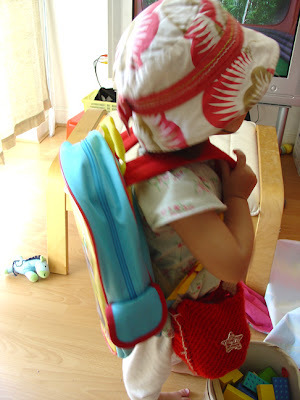 Shean Wenn puts on her hat, TWO bags, a "glove" (socks on hand) and struts over telling me excitedly (I was on the laptop, as always), "MUMMY, go to kool!" (go to school). 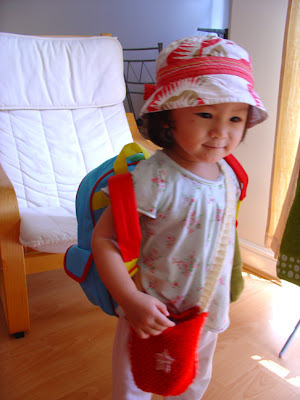 I guess (and hope) I don't have to worry about her going to school. She should settle pretty well? On another note, I can't believe it's been 2 years! Her drawing/ doodling makes my heart leaps up! It's as though I've seen a rainbow. Bright colours, bold strokes. She's an artist, alright! As i look closely at this drawing, I see SW drew a face on the right, with eyes, nose, mouth and mickey mouse ears? (It's in red on the right side). I wonder what she is thinking when she does her art? If you look carefully, you may have noticed both pares are crumpled. 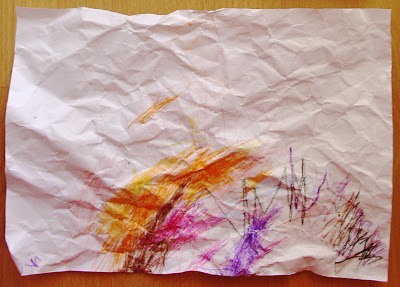 This is because my dear daughter will try to "fold" (crumple, more like it) the papers after drawing, she claims she is making a HAT!